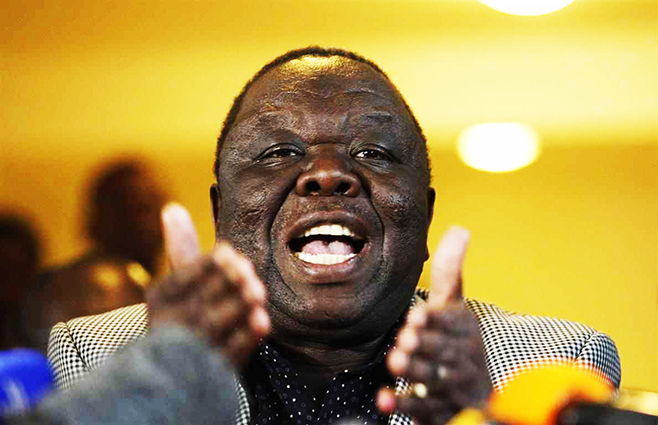 ZIMBABWE – People’s Democratic Party (PDP) deputy secretary General Tongai Matatu has urged the party leader Tendai Biti to stop verbally attacking fellow opposition leader Morgan Tsvangirai and, instead, concentrate on growing the party’s support base. According to New Zimbabwe, the former deputy minister of youth and indigenisation demanded “a paradigm shift” among the leadership, if PDP was to entertain any hopes of making an impact in 2018 elections. “The leadership should stop attacking Tsvangirai by calling him names like Gumbura each time they are given a platform to say something about the party and Zimbabwe,” said Matutu. Matutu acknowledged that Tsvangirai has grassroots support and his party can’t take that away from him. Matutu said PDP’s support base stands at 20,000 supporters countrywide adding the numbers have not been growing since breaking away from Tsvangirai’s MDC-T party.